Alexia Spicy Sweet Potato Fries, all wrapped up and ready to bake. Not too long ago, sweet potato fries were the sort of oddball dish you’d only find at a funky neighbourhood restaurant, the kind of place decked out in retro diner decor and frequented by booth after booth of insufferable hipsters. 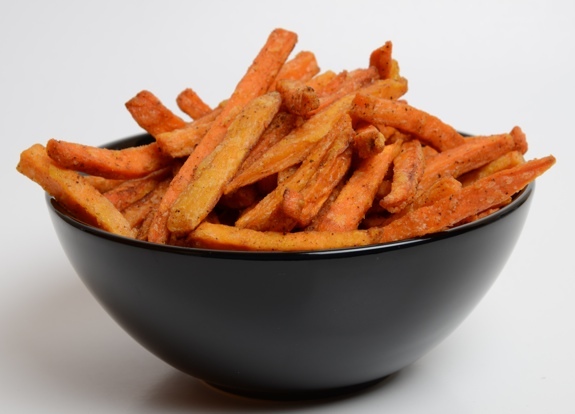 It’s only within the last two or three years that sweet potato fries popped up everywhere, hitting the mainstream in a big way. Blame the processed food industry (frozen fries in a giant bag!) or blame changing tastes – chances are, even your local family restaurant has hopped on the sweet-potato bandwagon. And so it’s no surprise to see ready-to-bake sweet potato fries in the freezer case, next to the frozen bags of garden-variety French fries. Compared to their plain potato brethren, they exude an air of foreign gourmet sophistication. Now that everyone serves them, some of the shine has rubbed off. What’s a fickle, trend-following foodie to do? Well, why not combine sweet potato fries with another recent food trend? 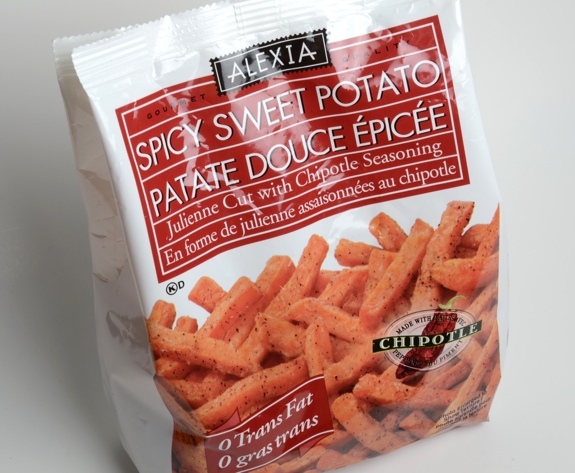 Ladies and gentlemen, I present to you … Alexia Spicy Sweet Potato Fries with chipotle peppers. Hot damn! Any flavour-of-the-month misgivings are quickly forgotten when you take a bite of these baked wonders. They’re crispy on the outside, soft and tender on the inside. The texture is much more mushy (in a good way) than standard potato fries, and the sweetness of the potatoes combines beautifully with the chipotle smoke. And yes, they’re spicy. Not scorch-your-mouth spicy, but enough that you get some warming heat. It’s a smoky pepper taste, which makes sense considering the whole chipotle thing. They pair well with ketchup, but they’d be even better with a smoky chipotle mayo dip. Fresh from the oven, served in a bowl. They're great on their own, but I like them with ketchup. For more spicy goodness, try serving them with a chipotle mayo for dipping. Cost: $5.29 for a 567 gram bag at Planet Organic. Value for cash money: Compared to regular frozen fries? Hella expensive. Availability: Big grocery stores. Made in U.S.A., so presumably available in the States, too. Nutrition? : 130 calories per 84 grams. Per package, that’s 878 calories. It’s not hard for an adult to eat half a package as a side to a burger. Front blurb says “0 Trans Fat,” but nutrition facts panel says 0.3 grams per 84 grams. Hmm. Lots of vitamin A, and a bit of vitamin C. Some fibre, too. The verdict: A nice change from standard fries or unseasoned sweet potato fries. Quickly becoming a staple in my freezer. I noticed that you are paying $5.29 per bag at Planet Organic. I’m not sure where you live, but I actually just priced these at all of the local stores (Northern VA) for an assignment in my consumerism class. All of the local grocery stores carried them for $3.98 a bag and Wal*Mart has them for a paltry $2.98. Go Wal*Mart! I, too, am TOTALLY in love with these things! I think I’ve seen them on sale at Planet Organic for a bit less than $4, but $2.98 is a whole lot cheaper than I’m used to. I’ve seen other Alexia products at local grocery stores other than Planet Organic (and usually for a lower price), but these spicy sweet potato fries are tough to find elsewhere.